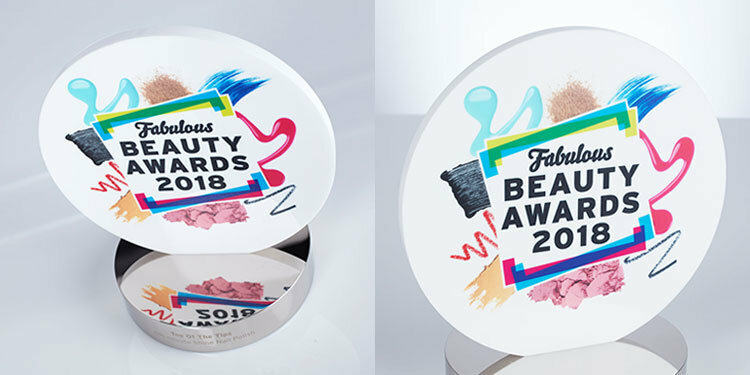 The winners of the Fabulous Beauty Awards 2018 were announced at a presentation ceremony on July 12. So-named after Fabulous Magazine, the Awards cover a host of diverse categories, from Hero Hair to Top of the Tips and Act of Kindness to Best Beauty Gadget, and over 150,00 readers’ votes were cast. Given the summer we are currently having, there will now be a mad dash to purchase the winner of the Suncare Safety Award (Nivea Sun Protect and Bronze Tan Activating Sun Lotion SPF30) and many of us should probably invest in a bit of TLC for our skins and look out for Elemis Pro Collagen Overnight Matrix, winner of the Skin Innovator category. The trophies, designed and produced by Special EFX, have a lovely fresh and zingy quality to them. Made in polished nickel plate, with a digitally printed acrylic central disk featuring the event’s graphics, the top part of the trophy neatly slots into the base for a professional and secure fit. TV presenter Laura Whitmore and Fabulous beauty editor Lauren Ezekial co-hosted the awards. EFX’s customer reported: “Really happy with the service I received from EFX, the process was from brief to delivery completely seamless and the awards looked fantastic. The winners were all thrilled”!